Following our recent wedding we would both like to thank you for the excellent service that we received from your company on this very special day. The service you gave us went a long way to ensuring that the day went off without a problem. We would be more than happy to recommend your company to others in the future. We would like to thank you and your drivers for the excellent service we received on our wedding day. Everyone commented on how lovely the cars were. The day was perfect and lots of nice photos were taken. Once again sincere thanks. Just a note to say thank you to your company for making our wedding day something spectacular. Please pass on our thanks to Martin who can only be described as a true professional and a credit to your company. We would have no hesitation in recommending your services to anyone in the future. Best wishes to all at U2R1. Go raibh maith agat! Just to say thank you for everything on the day. What a wonderful service you provide in the West of Ireland. Just brilliant. Thank you very much for all your hardwork. Your 1932 Rolls Royce was lovely and relaxing to travel in. Everyone who attended the wedding commented on how beautiful the car was. We have some superb photos to look back on. Once again thank you for all your hard work that day. Thank you very much for providing us with such stylish transport on our wedding day (7th July 2015)! and please say thanks to Martin our chaffeur. He was brilliant. Many thanks for providing us with a beautiful car and service which is second to none. No problem here recommending you to anyone. 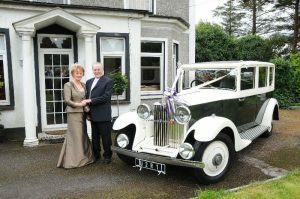 Thank you so much for transporting my mother and father to their 50th wedding anniversary reception, the rolls royce really made the day. It was all just like it was in “their” day. You helped to make a day our family will cherish for the rest of our lives. Many thanks for your help and attention to detail which made a wonderful day just that little bit better. The cars looked great and many complimentary comments were made during the day and night. I know this is business, but it helps enormously when someone injects a personal note into proceedings, it’s most greatly appreciated. I just wanted to send a note of thanks for the cars on our daughters wedding day which were splendid for the occasion, but in particular, would ask you to thank the drivers Martin & John who were patient, understanding and made the day that bit special.